Alright, first: I had a problem with the whole one-week time frame. I just had groceries delivered yesterday and I tend to buy all my food for 2-3 weeks at once. At the same time, I didn't want to leave out any of the delicious fruits and vegetables and leafy greens I'd gotten. So I threw everything in there. Even more pronounced is the grain/legume issue. I resupplied myself with bulk grains and legumes at a health food store a couple of weeks ago. Those will last me multiple months, but I couldn't very well scatter handfulls of chickpeas and bulgur and millet around, so I put the full cannisters/sacks in there. In addition to each individual item being overrepresented, the variety is also overrepresented. I eat all of the grains and beans pictured, but it's unlikely that, in any given week, I'll eat millet and quinoa and rice and bulgur and couscous and barley and chickpeas and lentils and adzuki beans and turtle beans and so on. So, yeah. Grains and beans are grossly overrepresented, moreso than produce. Packaged goods, on the other hand, I did a more reasonable assessment of. I mean, peanut butter's great, but it's hard to get excited about showing off all of my jars of peanut butter. One serves the purpose just fine. So with that caveat, I set about arranging the food for the photo. At first I relocated all the food from my kitchen to my living room, to show it off on the coffee table. But there was too much, so I cleaned off the kitchen counter and arranged things there. I carefully took all of the produce out of the plastic bags I store them in and artfully arranged it on the counter. It took about an hour, but by the time I was done everything was perfectly arrayed; it all fit on the counter, you could see everything, and the colors were carefully ballanced. I also arranged the food thematicaly, so pakaged goods were in one area, grains and beans in another. I had areas designated for fruit, root vegetables, cruciferous sprouts, and members of the nightshade family, with leafy greens placed near the front. Then I got out my camera and it exploded. Not literally, but at this point I'm resigned that it will never work again. It turns on fine, you can review photos taken, but if you try to take a photo it instantly turns off. Changing the batteries didn't help, turning it on and off a bunch didn't help. Apparently something in the photo-taking mechanism has shorted out. Thus: I had to take this picture with my flash-less, low-resolution cell phone camera. It's washed out and blurry and almost impossible to tell what anything is. And it doesn't have a timer, so I couldn't take a picture with myself in it. Blah. 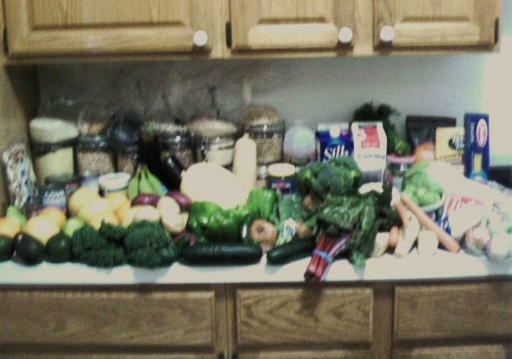 So, this is (significantly more than) one week of food for me. Using receipts as a baseline and estimating the amount of depreciation, I'd guess that a one-week portion of that food cost me about $50. On the plus side, the poor quality of the image makes it possible to play a diverting game of "what exactly is in that photo?" in the comments section. This page contains a single entry by Zach published on February 18, 2008 6:51 PM. Vegan Recipe: Chocolate-Oatmeal Macaroons (Zero-Calorie Carob-flavored Rice Cake Snacks) was the previous entry in this blog. Means and Ends is the next entry in this blog.